We offer mainly one canoe tour but if it does not suit your needs we can tailor it to your needs. Also you can rent a canoe from us to take a 30 min. sailing with your family or friends in Grenivik harbour. A meal from a local restaurant can be bought with canoe tours for an extra fee of 2500 ISK. Canoeing is a great family activity and the tours are suitable for children and adults alike. We have two canoes and each can hold up to two adults and two children, depending on the size of the participant. 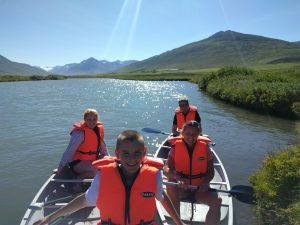 CapeTours offers a canoe tour from Grýta to the confluence of Hólsá and the Grýtu stream. A wonderful tour in beautiful nature and a must do for outdoors enthusiast. We have one canoe that holds two adults along with the guide, one or two children can ride along. Another canoe is a posibility if needed. Price: 20.000 ISK per trip. Inclusive in the price: Use of canoe, life vests and oars, along with basic canoe instructions and a guide. Our Tour in Grenivík takes place a little ways from town, below the farm Grýtubakki as shown on the map below. You can zoom in or out to get a better perspective. There must always be at least one adult in each canoe if any participants are younger than fourteen. Price: 4.000 ISK per canoe for 30 minutes. All you need to bring is clothing that fits the weather.